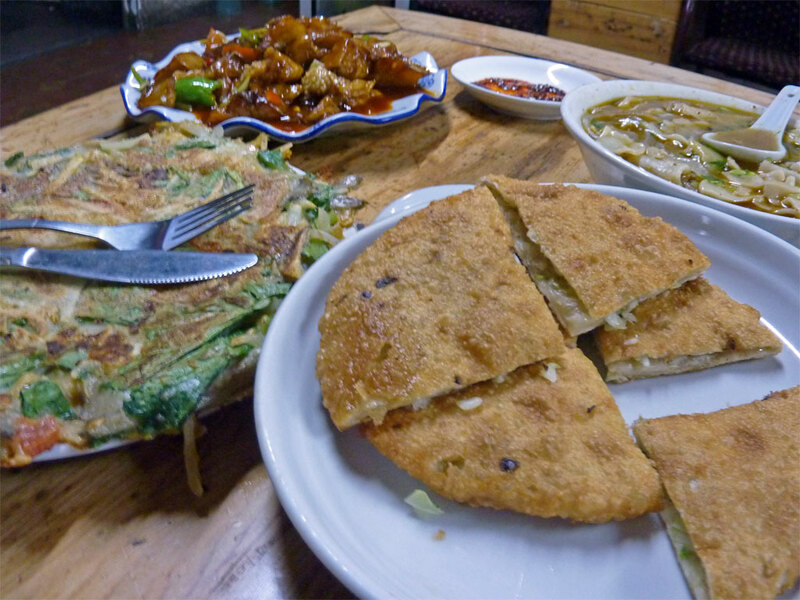 Despite many of the changes taking place in Xiahe, mentioned in the previous article, don’t be put you off from visiting. 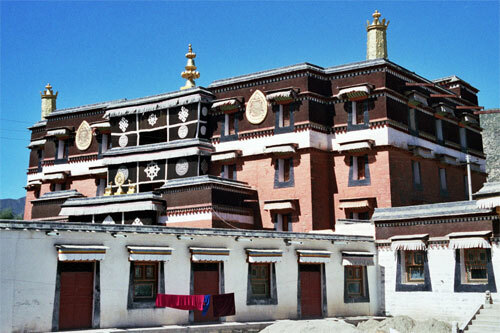 Xiahe, and in particular its monastery, is still a fascinating place; though you might want to get there quick! Start your first visit with the obligatory guided tour around some of the main temples and halls. These days, there are English-speaking guides and our 2011 guide was truly excellent; a great improvement on the 2004 one. He tells us, among other things, that he learnt all his English in Xining and that he is a second-year philosophy student. Apparently, the monks studying philosophy have to pass 13 levels of knowledge, the equivalent of 13 years’ of study. 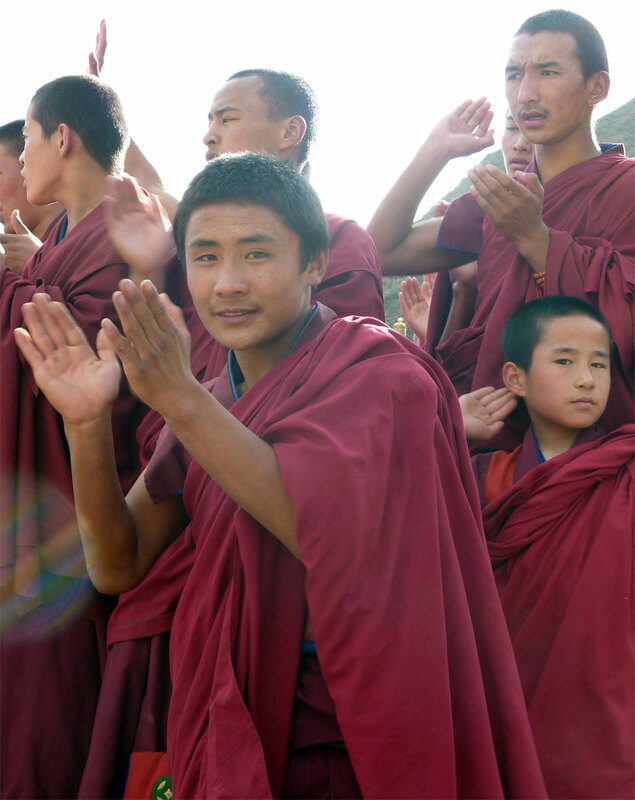 He says that many of the younger monks find it quite difficult to be strict vegetarians. 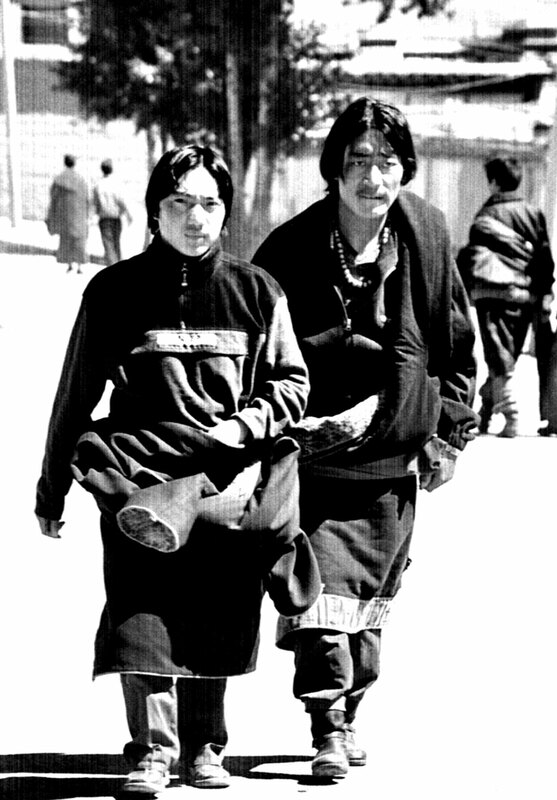 Having been brought up on a nomads’ diet, their bodies crave meat, especially during the bitterly cold winter months. The masters and lamas, however, do without meat and tend to eat very little (though you wouldn’t say so, judging by their sturdy physiques). As photography is not allowed inside the halls, with the exception of the room that holds the yak butter sculptures, it is quite difficult to remember all you’ve seen. The dusky, atmospheric halls, the countless statues, the shimmering candles, the colourful paintings and rich wall hangings all are a real onslaught on the senses. So what follows can be no more than an impression; a collage of our three visits to the monastery. The temple halls are beautiful both outside and in: outside they are painted in striking layers of white and reddish-brown, crowned by sloping roofs made of layers of tightly pressed little twigs and topped by golden ornaments, such as dragons, deer, wheels or thunderbolts; inside they hold huge golden statues, colourful murals and thangkas (Tibetan religious paintings on silk, often with embroidery), stacks of ancient books, etc. 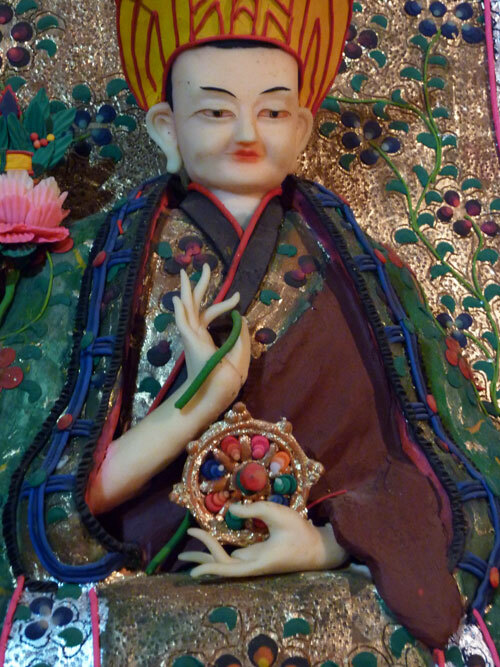 There are all the usual paraphernalia of Tibetan Buddhism, of which we have seen so many by now, and yet … the place feels different, more serene, more serious and somehow, more meaningful in a religious sense. 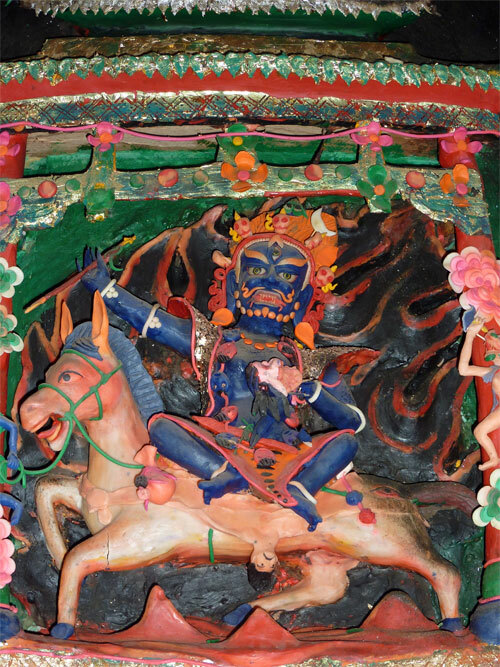 Another highlight is the hall of the yak butter sculptures, where colourful renditions of gods and demons are kept for one year, to be destroyed during the Tibetan New Year’s celebrations. Little pieces are distributed among the pilgrims, who take them home as relics. 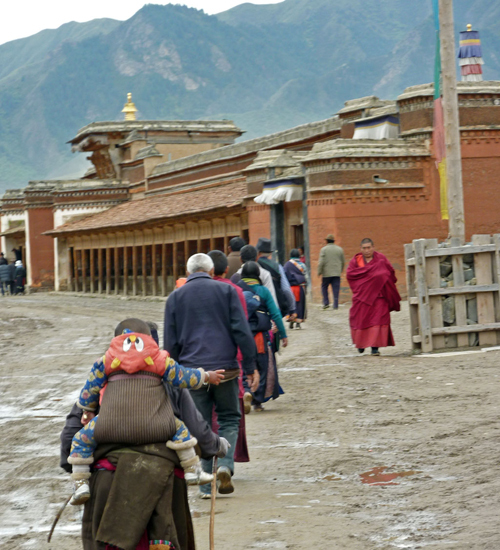 The pilgrims in turn donate tubs or lumps of fresh yak butter, for the creation of new sculptures. 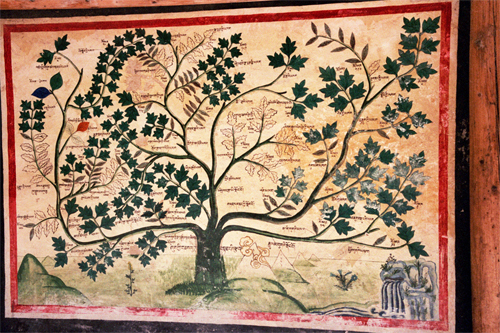 You may also be taken to the Medicine Hall, where you can check out the paintings of medicinal plants all around the courtyard. If you tour the monastery in the early afternoon – which seemed to be the quiet time when most Chinese tourists are eating – you can finish with a visit to the debating grounds. 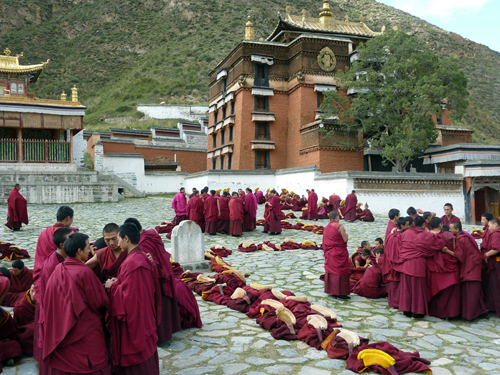 On a square, not far from the entrance, student monks gather every day around five to discuss theological and philosophical questions, under the supervision of their masters. 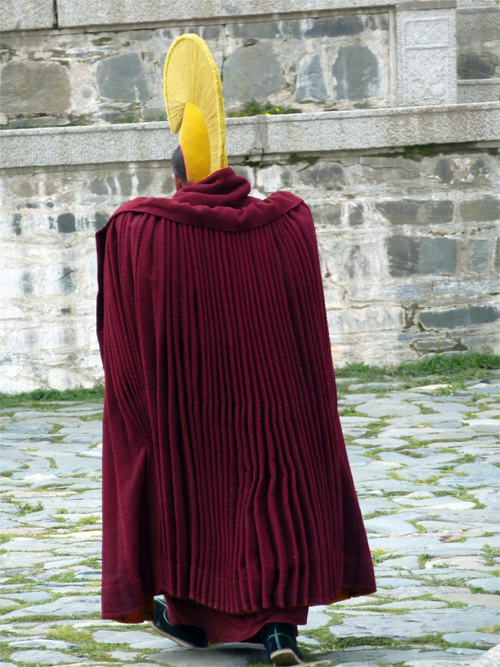 They arrive in small groups, dressed in heavy, pleated, wine-coloured capes and plumed yellow hats, the younger ones chattering like excited schoolboys. The imposing masters, however, resemble Roman centurions, with their stern, haughty expressions, ramrod-straight backs and broad-shouldered, flowing robes. As you will see, these monastic debates are far from sedate, academic discussions. The debaters take off their capes and hats, put them on the ground, and then the fun begins. 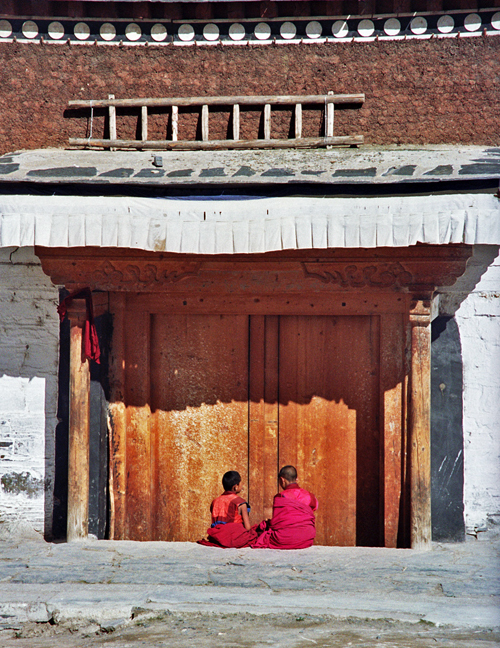 Some monks sit down in little groups, usually with their fellow students, while others stand before them and interrogate them. 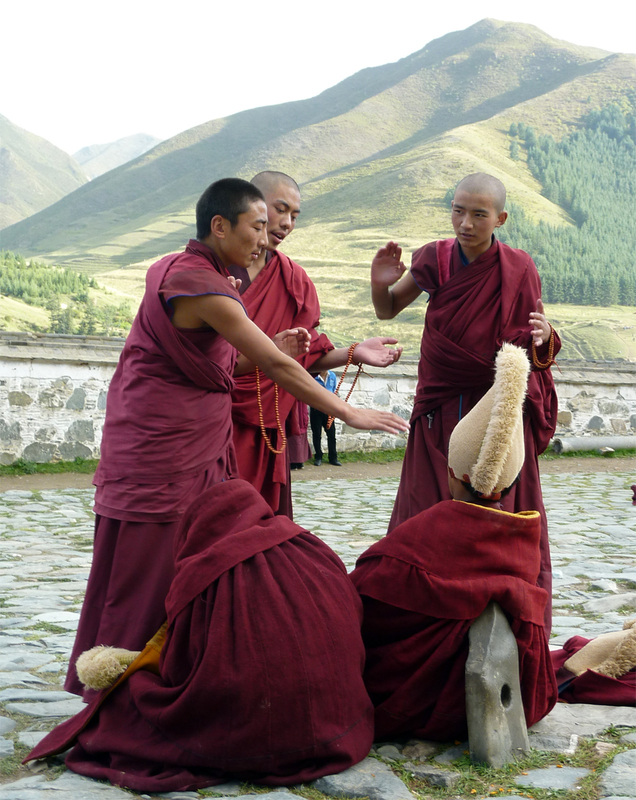 The standing monks accompany their questions with exaggerated gestures and slap their hands together loudly, as if daring the seated ones to come up with the right answer. 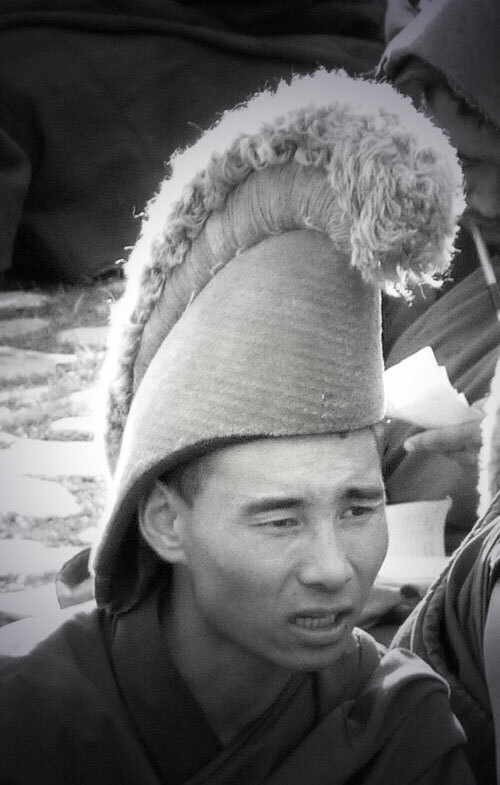 The hapless monks who are at a loss for words are teased relentlessly, though good-naturedly. The whole monastic village is a fascinating place for strolling and soaking up the atmosphere and there are many places, like the debating grounds, which you can visit on your own, though you may have to buy the odd, additional ticket. 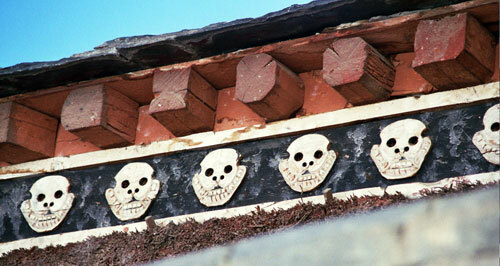 The Barkhang, or printing press, is one of these. 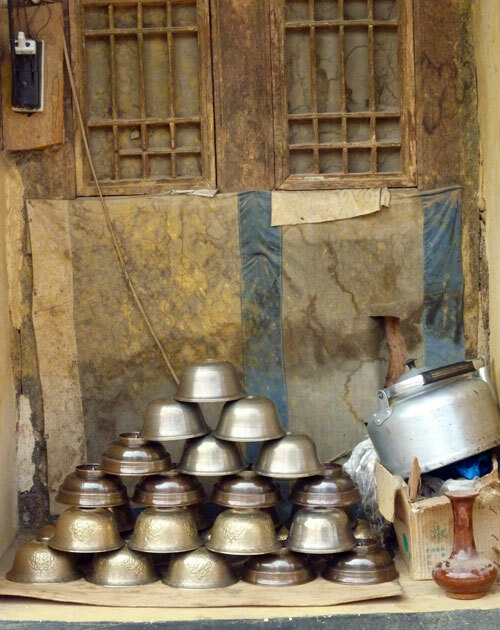 It’s located in a tall, fairly new building, set around a large courtyard where many pilgrims seem to take a rest, propped up against the small bundles that hold their belongings. In the centre of the courtyard, there are a couple of huge cauldrons in which a heady stew of intestines, pigs’ ears and trotters is constantly bubbling away. 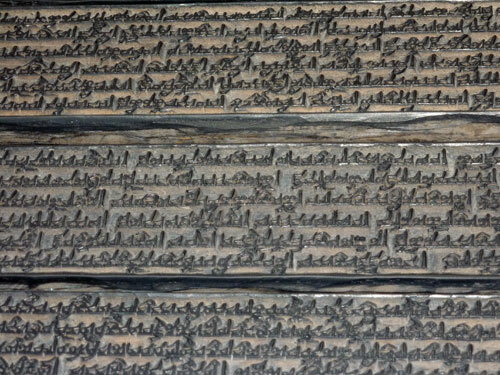 On the ground floor of the print, several teams of young monks are busy printing materials, following the ancient tradition: one monk spreads the ink onto a wooden slab, the other presses a piece of cloth or paper against it. 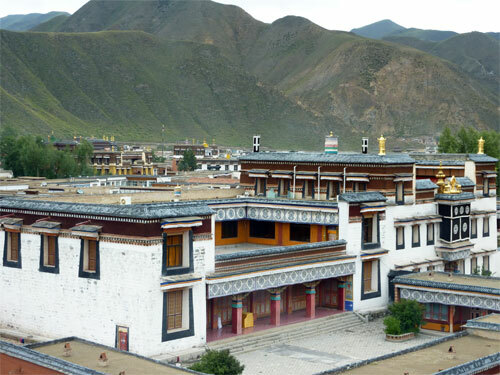 It reminds us of our visit to the famous monastery and printing house in Dege, Sichuan, which dates as far back as 1729 and is said to hold as much as 70% of Tibet’s literary heritage. 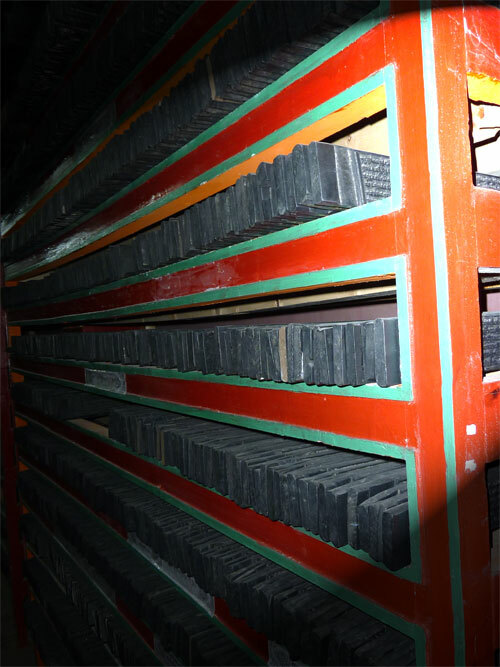 In the back rooms and on the first floor of the print, many more wooden blocks – each representing (part of) a book – are kept and several other teams are at work, busily printing away, accompanied by the news on the radio, in this case. 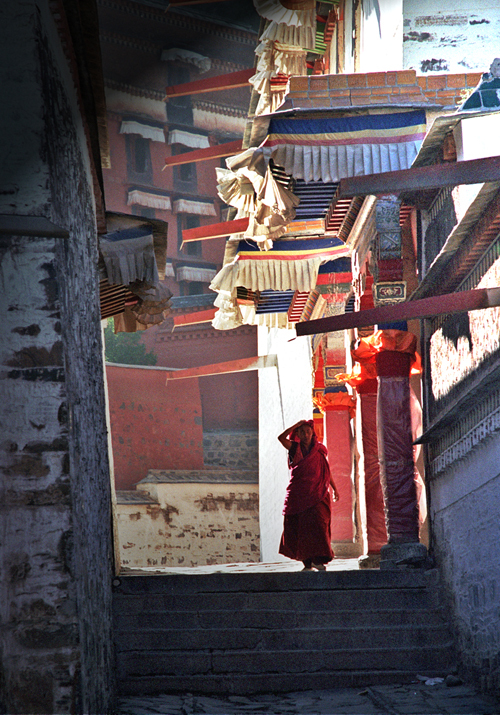 Once you’ve explored the monastery proper, you can walk the kora, the pilgrims’ trail that circles the monastery. We start our circuit at the row of prayer wheels that run parallel to the river, close to the main entrance, and try to ignore the machinery and the workmen digging nearby. On the other side of the dirt path, we spy a line of small, glass-fronted workshops where many thangka painters are at work. The painters are a relaxed bunch and seem quite happy for us to come in and watch them at work. 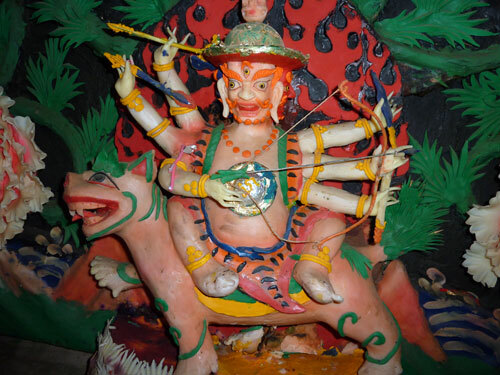 According to the painters, the finished products from their workshops are sent out to Tibetan monasteries all over China, and even Tibet; they aren’t meant for the tourist market (yet). After a while, we come to an elaborate outer gate with charismatic dragons at the corners. Behind this gate lies the Manjushri temple with its magnificent golden statue, covered in precious and semi-precious stones, which apparently hailed from Lhasa. 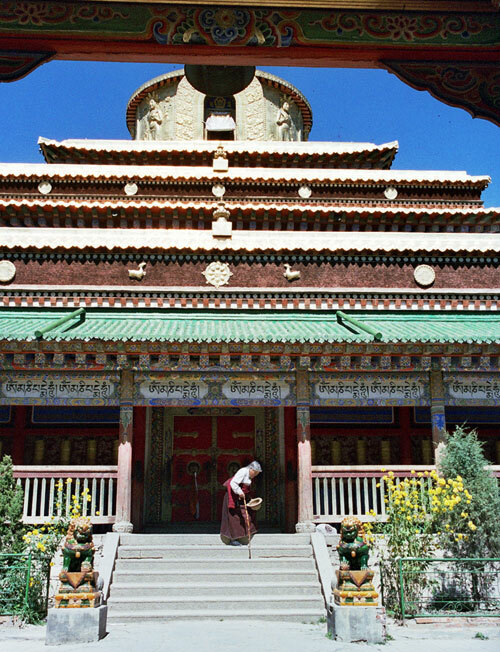 It is surrounded by niches that hold some 1,000 small golden Buddhas, as well as silver standards, huge bronze candleholders and yak-butter flower sculptures. 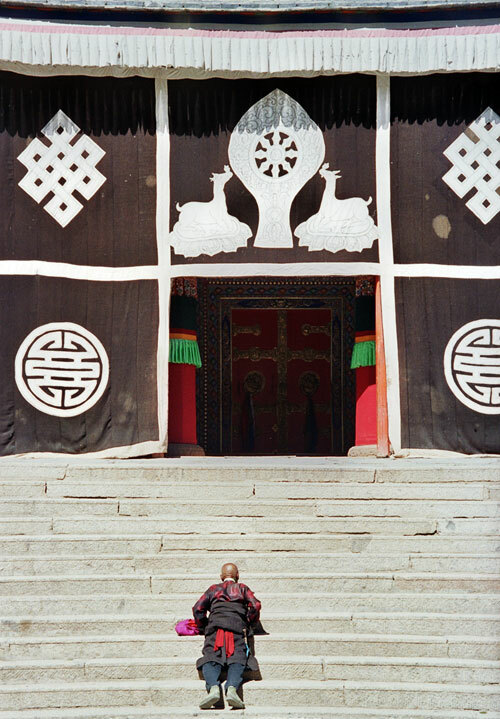 As we have bought a ticket, the temple door – with its handsome golden lock and decorations – is opened for us, and a stream of pilgrims take advantage and steam in after us, prostrating themselves in front of the statue. 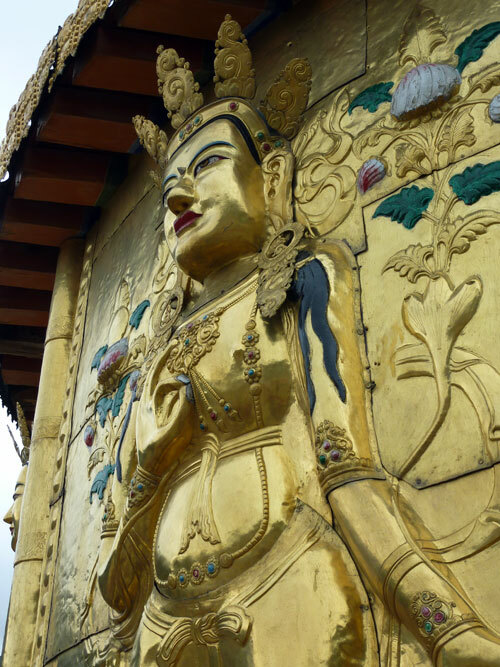 Another highlight is the Gongtang Chörten (Pagoda), where you can climb up to the top and walk around the multiple golden faces of serenely smiling Buddhas, glittering in the sun. 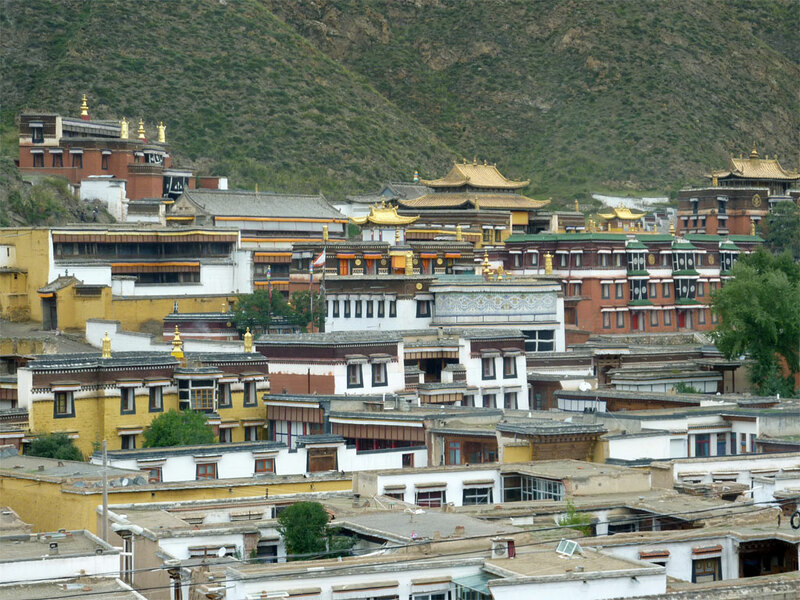 The views over the monastery and Tibetan old town are stunning. 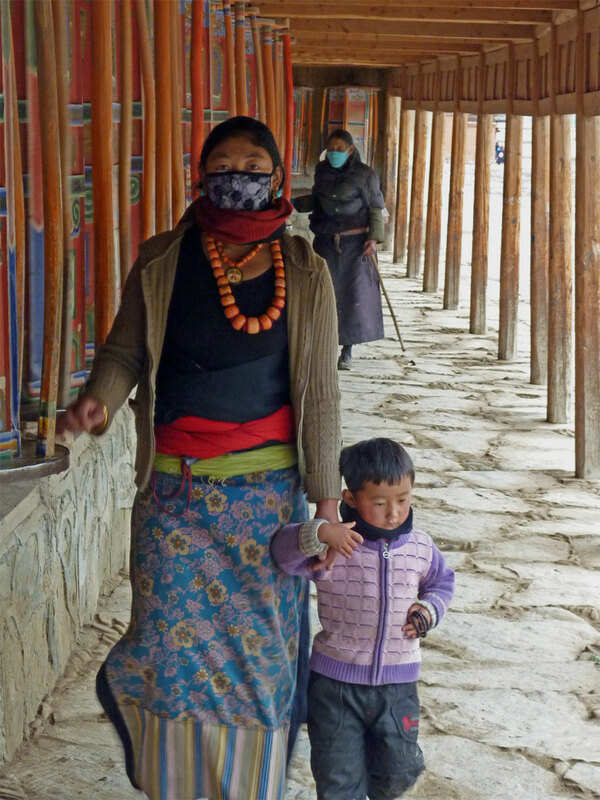 Once the kora turns away from the river and starts skirting the side and back walls of the monastery there are fewer prayer wheels. Now it’s just a quiet, dusty path where pilgrims shuffle along single file, and where you can get great views over the main halls. Eventually, the circuit ends at a white pagoda and another gallery of prayer wheels, this one parallel to one of Xiahe’s market streets. Apart from the views, what makes the kora so memorable, is the great mix of people you’ll meet along the way; from tiny, venerable old ladies shuffling along, grey braids swinging on their bent backs, to toothless grandfathers drowning in their huge greatcoats; handsome young women with burnished cheeks, bedecked with chunky turquoise and coral jewellery, or cheeky youngsters in leather jackets and sneakers. 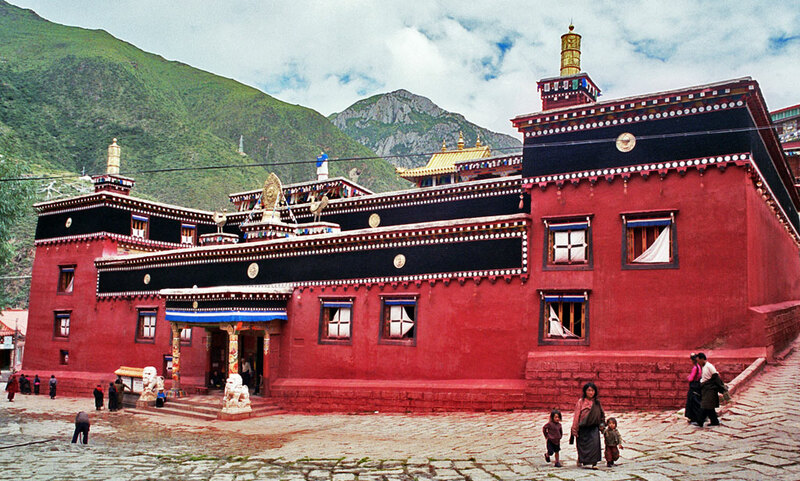 Apart from walking the kora, there is also the Tibetan village to explore. 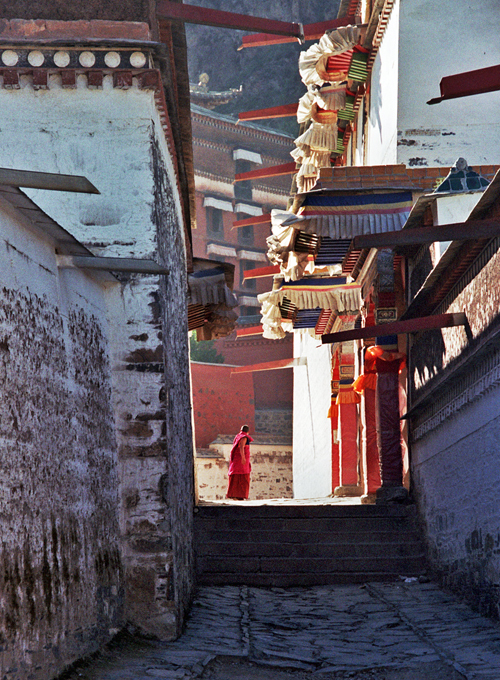 This is the original, old part of town, which lies right next to the monastery, and which is still 100% Tibetan. 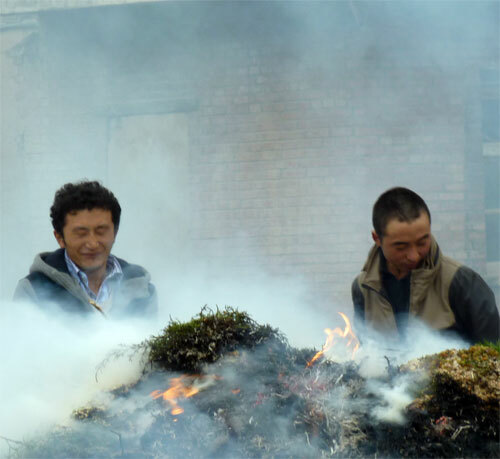 The Tibetan village, in fact, is as filthy as we remember it from previous visits, with litter strewn about the open-guttered, un-tarmacked streets, pigs rutting around in piles of garbage, snot-nosed little kids and bedraggled-looking mongrels playing in the dirt. 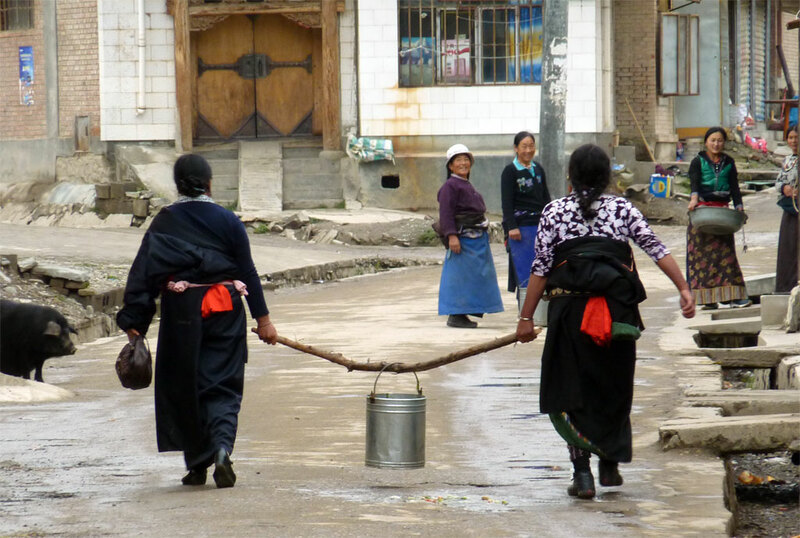 We walk behind a group of young women, carrying buckets of water on a yoke, for running water is also conspicuous by its absence here in the Tibetan quarter. Then we veer to the right and climb up to the two small monasteries that lie slightly above the village. The first one is closed, but in the second one, which is actually a nunnery, a very young nun interrupts her prostrations outside the main hall in order to sell us a ticket and show us around. She is evidently proud of her temple, though I cannot but wonder at the hard, rather isolated life of deprivation she must be living here. 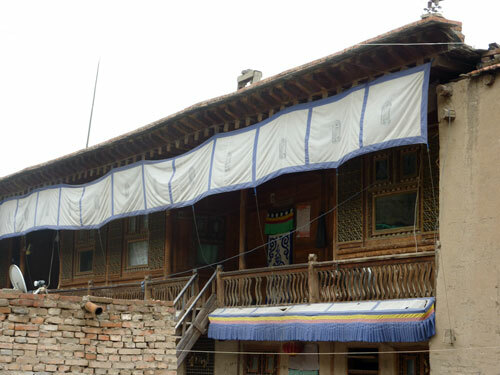 On the south side of the Daxia River, on a hill opposite the monastery, you can find the Thangka display place. At the opening of the Monlam festival, which is celebrated three days after the Tibetan New Year (late February – early March), a massive Thangka of 20 by 30 metres is unfurled and displayed here. Processions and dances also take place during the festival. 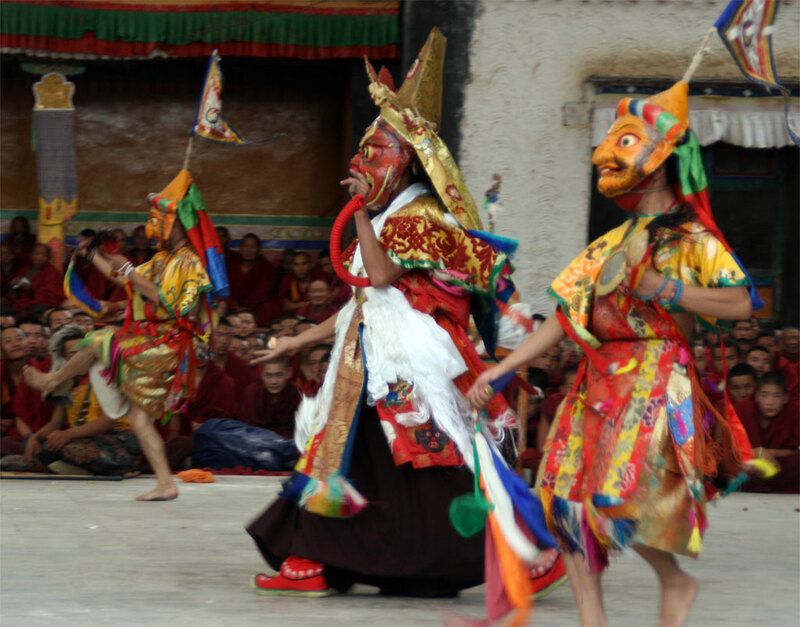 If these dances are anything like the ones we were lucky enough to see in Shigatse, Tibet, they are truly spectacular! At other times of the year, the platform is a good spot from which to admire the monastery. 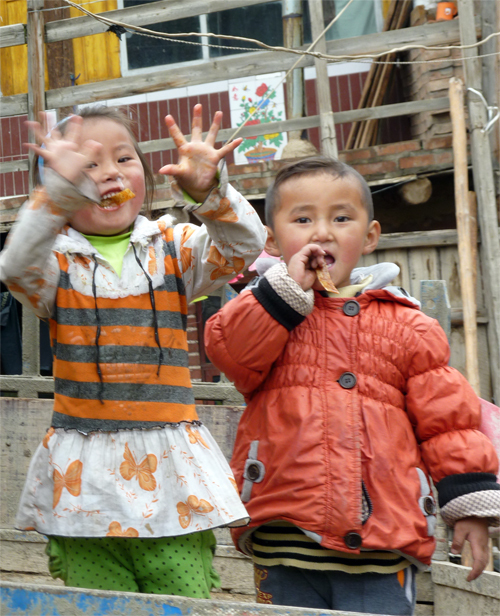 We just didn’t spend enough time in Xiahe. 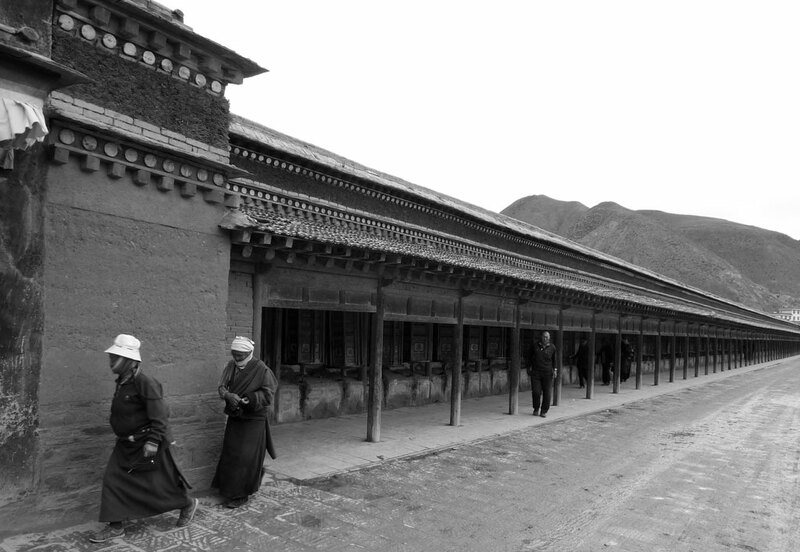 I would like to return to Labrang. As usual these are amazing pictures.